Biomedical Engineering senior Matt Mender has been elected to the 2015 CoSIDA Academic All-America Division III Football Team by members of the College Sports Information Directors of America. This is the second consecutive Academic All-America honor for Mender, a defensive tackle from Glens Falls, NY. He was a Second Team honoree in 2014 – and the only player from a New York State college chosen to the Division III team. This year, he earned a spot on the First Team. “Matt is just an impressive person,” says Biomedical Engineering Department Chair Richard Waugh. “I have been his academic advisor since he arrived as a freshman, and his accomplishments continue to impress me. Not only is he a star athlete, but his GPA has been above 3.8 in each of the last four semesters! He is a natural leader. I could not be more proud of him." Mender started every game on the defensive line in 2015, registering a total of 63 tackles. He was named First Team All-Liberty League in post-season voting by the league's head coaches. 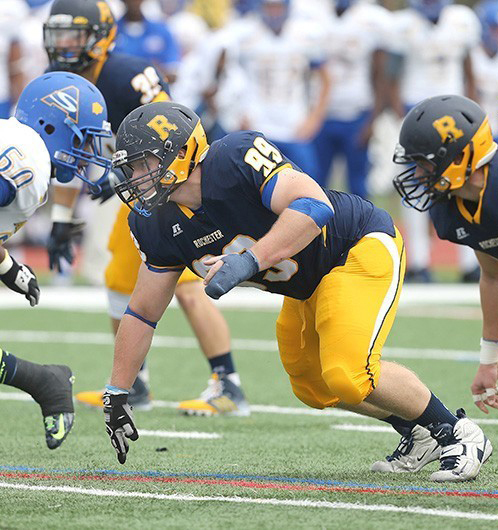 As a senior, he had 12 tackles against Springfield College in a 29-3 Rochester win and 11 tackles on Meliora (Homecoming) Weekend against Merchant Marine (a 24-17 victory). Mender was a semifinalist for the 2015 National Football Foundation Post-Graduate Scholarship. He is a member of Alpha Eta Mu Beta, the national honor society for Biomedical Engineering, and currently works in the Auditory Neuroscience Lab. Last summer, he did research work on Parkinson's Disease. Mender is a member of the University’s Biomedical Engineering Society (BMES) student chapter and was a teaching assistant for a Biosystems course. He serves on the executive board of his campus fraternity and oversees their community service efforts. In September, he was named as a Garnish Scholar at Rochester, one of the top 10 senior student-athletes.